Whether you are looking to buy an Andalusian Horse, or need help to deal with any kind of horse with which you are experiencing behaviour problems, Miquel is available to assist you in every way. 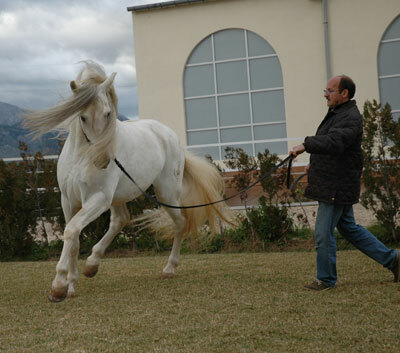 As a young adult Miquel had the great fortune to meet Don Pedro Salas, one of the most famous International judges and breeder of Spanish Horses in Spain, who had an encyclopaedic knowledge of the Breed and who pioneered the introduction of the Spanish Horse to the continents of Australia and America. Under his wing Miquel studied the characteristics, morphology, genetic origins, history and temperament of this ancient breed. In 2003 he judged the Spanish Horse classes, both inhand and ridden at the Richmond Horse Show. "The Spanish horse was born with the knowledge of how to do it - It is us that has to learn how to ask"
These are the pure bred Spanish Horses (Pura Raza Española). Add Andalusian Horses to your favourites!